Wherever you are in your customer experience (CX) journey, you can adopt proven best practices to advance your CX initiatives. In this webinar, you will learn the four building blocks of successful CX–and how to incorporate them into your CX program. 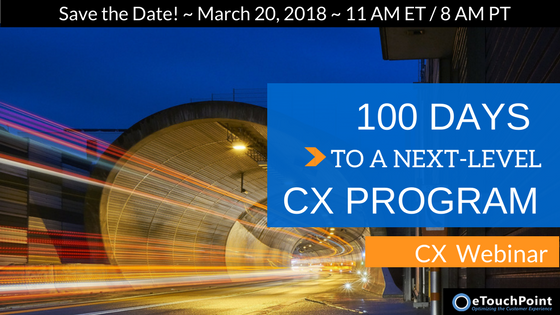 Our experience working with corporate CX leaders has found organizations can accelerate their CX program in as little as 100 days. In addition to gaining best practice insight, every company that registers will be eligible for a free CX strategy assessment by eTouchPoint’s CX experts to guide you to new levels of CX excellence. Get professional tips on how to design effective multi-channel surveys, select the best feedback channels, improve response rates, and more. Learn how to establish and manage alerts tied to traditional CX surveys and voice of the customer (VoC) feedback. And understand core alert metrics you can track to achieve best-in-class CX. Understand the differences between automated and human-based transcription of VoC comments–and gain tips and tools for effective verbatim analysis. Find out how to build an effective reporting program and which reports to push out to various internal audiences. Also, learn how CX innovators are using customer feedback to commend exceptional employees. You may be just making your first investments in CX—or have a baseline program in place. In either scenario, our webinar will help you envision your CX future and prioritize critical next steps. Register today for real-world insights and proven practices that you can apply to deliver exceptional experiences to your customers.